Last edited by [omega] on Thu Sep 13, 2018 10:52 pm, edited 1 time in total. Leo_Convoy wrote: So i'm done with Beachcomber. [snip] Fixed, with the magic of photoshop! Love it Leo_Convoy! I can't help but see two pairs of eyebrows #MilneStyle. 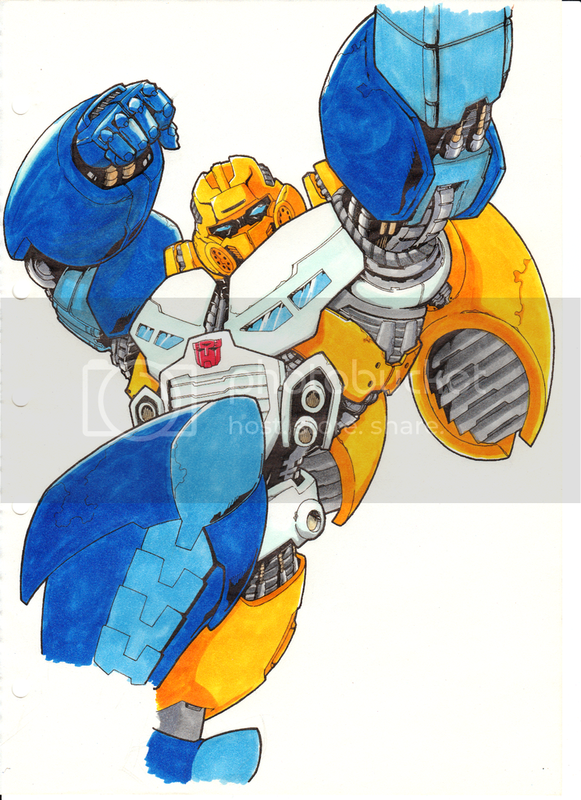 I reckon Beachcomber would be an interesting character to feature in IDW's post-war world, given his pacifist leanings. Mr_Ash wrote: I'd love to see a colour piece of the TFNZ-infamous Knockoff 'Fruit Salad Demolishor' - preferably yelling "CRURA PINCH!" while karate-chopping someone. Oh yes. Yes yes yes yes. I was just looking back at some of those old posts after seeing this Piranacon KO on eBay. Nice work man, copic markers are the bomb. Yeah, I wanted someone else to have eyebrows besides Rung. From what I've tried of them, markers are certainly fun. However you do have to make use of them otherwise they can dry up. At least that happened with a few pens when I tried them out briefly. If you're looking for inspiration from the less beaten path, how about things like the G1 Micromasters? Ah - never say that. If you can draw a stickman then you're already off to a great start.